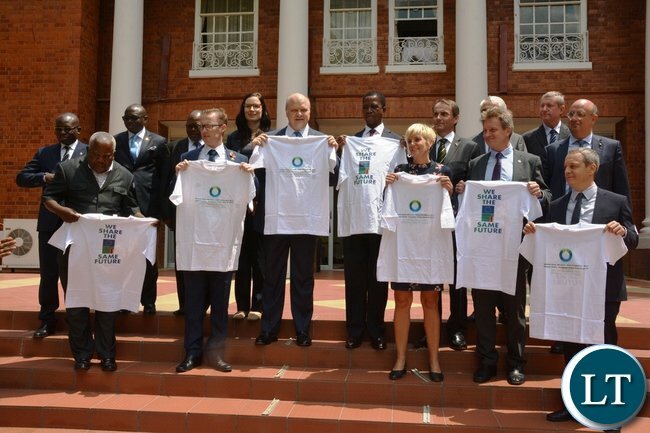 President Edgar Lungu has appealed to the European Union to help Zambia build capacity in investigative wings to fight corruption in the country. President Lungu says the problem of corruption can NOT be addressed by mare accusation and finger pointing but need capacity building to fight the vice. 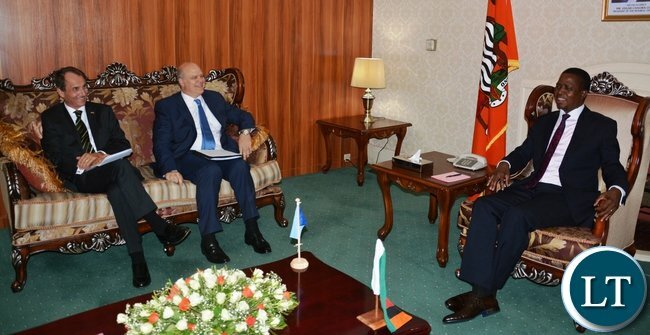 The President was speaking when he met a delegation from the European Union-EU-and African Union-AU during a closed-door meeting at State House in Lusaka. Special Assistant to the President for Press and Public Relations Amos Chanda briefed Journalists after the meeting that the EU and AU would consider helping Zambia to build capacity in the fight against corruption. And Mr. Chanda said the EU delegates also talked about the current political situations in the Democratic Republic of Congo which has led to Thousands of asylum seekers trooping into the country. He said the delegates expressed concern that the worsening political conflict in Congo D.R. would make it difficult for Zambia to host the increasing number of refugees. Mr. Chanda said the EU and AU have pledged to render Financial support to help Zambia host the Congolese refugees. Meanwhile Mr. Chanda also disclosed that President LUNGU was also briefed about upcoming 5th African Union-European Union Summit to be held on November 29-30 in Abidjan, Cote D’Ivoire. Not a single Euro, this country is too corrupt!!!!!!!!!!! Very embarrassing, everything you want help from the West or China. What can black people do for themselves? Is it that the only thing that the “lazy” Zambian educated can do is drinking beer? Hahahahahaha! What a JOKE !!!!! The MOST CORRUPT PERSON in Zambia is begging the EU for money to FIGHT CORRUPTION ??? So that he can CORRUPTLY STEAL THAT MONEY ALSO ?? Does he really think these whites are that 5TUPID ???? Lungu, just take YOUR CORRUPTLY GAINED TWO MILLION DOLLARS and pay for ANTI – CORRUPTION from THAT !! Only then we will believe you are serious! I thought we have the ACC, Zambia police and other investigative agencies that have capacity or have we not? This is a lazy excuse to fight corruption, there is simply no will whatsoever. Just the other day we were told to take evidence to ACC and the auditor general’s report has a lot of that evidence. Why are we failing to fight this vise? May be it has become part of our daily livelihood under PF. EU please do not participate in helping this ille.gal regime strengthen its grip on power. Remeber this is same g.u.y. who has been calling you imperialists. In fact Lu.ngu & Co will instead use the same resources against anyone opposed to them. lungu is the corruption….42/42, $ 6 million to jimmy fingers , $ 288k ambulances the list is endless…..
no president wound have stood by and watched this kind of corruption, that is why kambwlili says lungu is leading the corruption…. Hahahahahaha…. This is very funny.. Show us what you are doing with the little “capacity” we have. Scandal after scandal and the top guy is right in the center of it. It’s such a joke my sibling..
Its really a confirmation of what is taking place in those offices across the country. The people are corrupt. The truth finally comes out from the horse’s own mouth!! He can’t manage his own affairs, he can’t fiight corruption without the intervention from imperialists? No President Lungu is the most powerful man in our country right now.. if he tells the head of ACC to jump he or she shall jump.. if he tells the DPP or any General to sit down they ll do it… if he tells the head of the police to retire or change how the police works it will happen.. he has the capacity, maybe he can’t just realise it, but my best guess is that he just isn’t willing Cos he’s a participant. They don’t want to be embarrassed in 2021. But they’re have given the opposition a lot of ammunition. And I don’t know how the world is just going to turn a blind eye. The Pope of Corruption Chagwa has spoken. This is WHAT HAPPENS WHEN SOME ONE HAS NO INTEREST IN WORKING, DOING THE JOB, BUT IS ONLY INTERESTED IN THE TRAPPINGS THAT COME WITH THE JOB TITLE!! He knows that CORRUPTION STARTS AND ENDS WITH HIM but HE CANNOT STOP IT BCOZ HE FEELS IT IS BENEFICIAL TO HIM and feels OTHER PEOPLE SHOULD BE WORKING TO END IT, NOT HIM!! What a great disappointment and loss we have in this man as our leader!! How do you seek help when you drive corruption?you walk, talk corruption yet you want money that will be used or abused. We can start with Paradise! Paradise guy! He only wants more money to STEAL !!!!! It takes guts admit that you need help. If you’re against this request it means you want to perpetuate corruption which means you’re benefiting or planning to benefit from it. I’m behind you on this one ba kateka wesu.